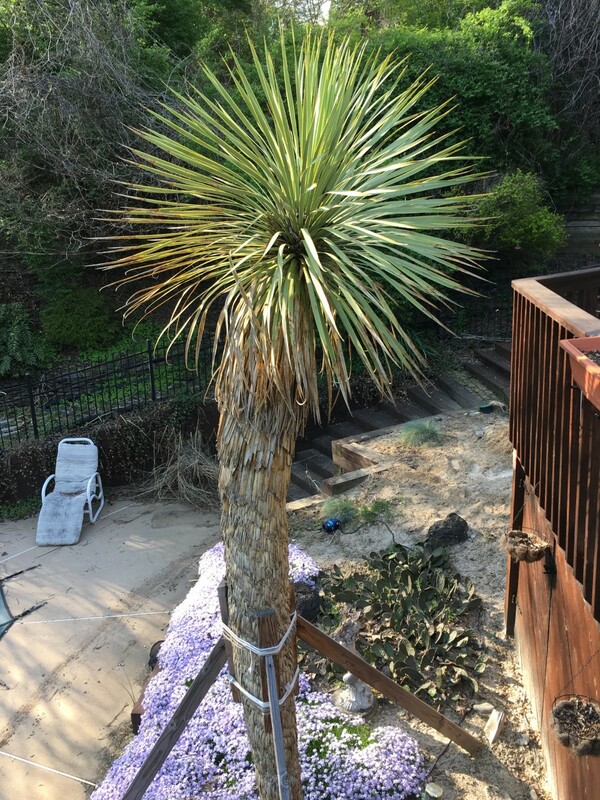 I need help identifying this particular palm tree. Unfortunately, I don’t have many details to give, and I’m by no means one to say I’m even an amateur at plant identification. We are unsure of its origin and can only confirm it’s age by how long we’ve resided here in Hockessin, Delaware. The plant is over the age of 14, and it stands a little over 12 feet high. The foliage is composed of single green shoots coming from the head of the plant which descend gracefully and reorganize into what one without knowledge would say is bark. We are looking to purchase another tree of this species or a close relative; there was a recent loss of an identical tree which sat opposed to this one. Appears to me to be a Yucca tree, from the family Asparagaceae, whereas palms are typically a member of Arecaceae. After searching various sites about cold-hardy yuccas, and looking at images, I think you have Yucca rostrata or possibly a hybrid of it. According to Wikipedia it can be grown in zone 5. Your location is zone 7, but perhaps if the microhabitat is just right it can survive your winters (perhaps the sandy soil evident in the picture helps it survive, since sand drains well). I suggest you look at the description of the plant and images online and compare it to your specimen to see how well it fits.